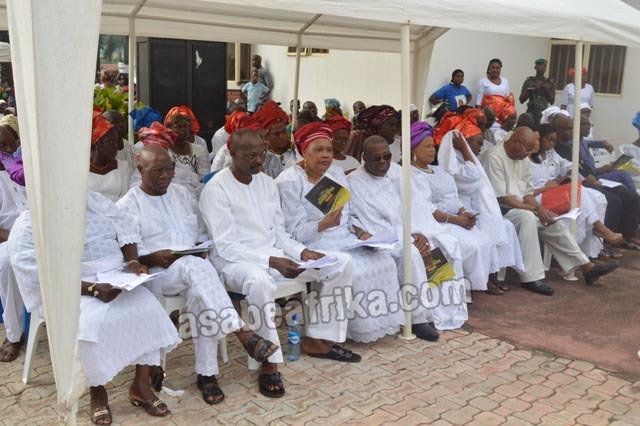 When the family of late Madam Rachael `Emife Jemibewon convened in the historic town of Iyah-Gbedde (A town between Aiyetoro and Gbedde after Kabba) in Ijumu Local Government Area of Kogi State, North Central Nigeria, between Wednesday August 3 and Friday, August 5, 2016 in honor of their late matriach, it was not only to give the commited Christian and community Woman leader who left this world after living a century and six years a befitting funeral. It was equally for the golden purpose of celebrating the life and legacies of a great woman who played impactful roles in the lives of countless people in her lifetime. 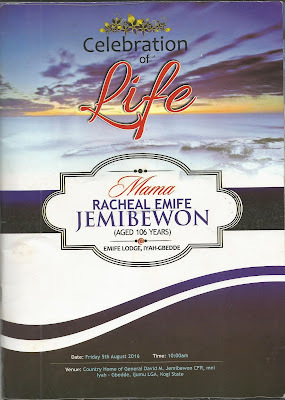 Mama Rachael Emife Jemibewon indeed deserved no less as she was an accomplished christian and mother who, beyond being a loving mother, counselor and destiny molder was also a paragon of character and an epitome of good christian values. She died in her sleep in the early hours of Thursday July 21, at the ripe age of a hundred and six years (106). 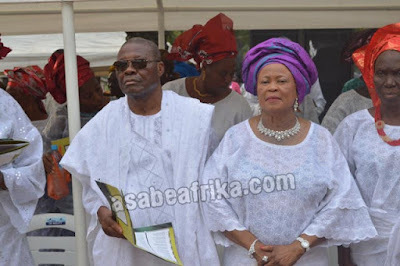 Her star son, Major General David Medayese Jemibewon (CFR, Mni), an elder statesman, military administrator of repute and educationist per-excellence invited the who-is-who in Nigeria to join him commit his precious mother to mother’s heart. He and his surviving elder sister, Madam Janet Owadokun (Nee Jemibewon) a retired Civil Servant were overwhelmed with the tremendous amount of goodwill of presence as personalities stormed the event from all nooks and cranies of the world. 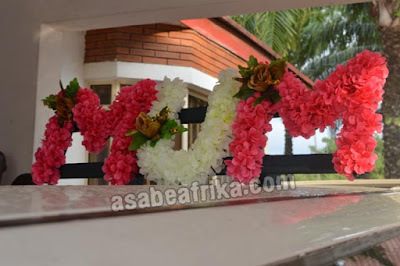 Your Africa’s number 1 Celebrity Encounter blog, Asabeafrika was the official blog for the event. 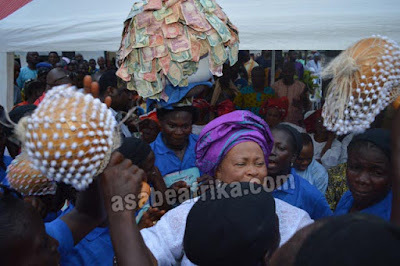 We were at the 3 days carnival like event and we bring you behind the scene activities of what took place at Mama Rachael Emife Jemibewon’s funeral. Take a sit with your favorite drink and snack as we take you on a ride of behind-the-scene happenstances. Enjoy. Mama Emife (Which means ‘The One I love’) was born about One hundred and six years ago to Mama Jemibiyi (Jembi) and Pa Olujitan. The story of her life cannot be complete without a glimpse into her ancestral origin. Her grandmother was born at Agbara and she got married to a man from Akure (both settlements form integral part of modern Aiyegunle-Gbedde in Kogi State). Her grandmother had six children which includes mama’s mother, Mobayo (Iyemose) and Obamila (of Agbara) before her husband passed away. 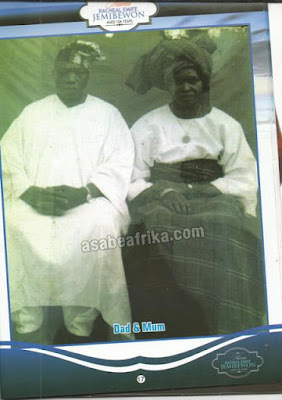 After the death of her husband, she was re-married to Emiwonasaiye, who had the chieftaincy title, Ologe, and was the Olu of Iya-Gbedde and had Mojefe (Daniel Ologe’s father), a twin, one was killed and burried as was the tradition then, leaving one to survive, named Bofemihi (Bofe) and lastly a girl, who died young. Mama Emife’s grandmother died soon after the death of her last child. In a short tribute written by her son during the occasion of her 95th birthday in year 2005, Mama gave the entire naration of story of her life in her own word. 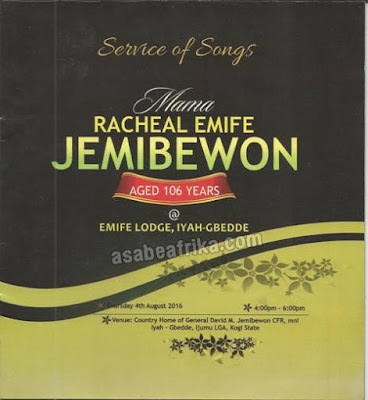 This is what the late Mama Rachael Emife Jemibewon said about herself on her 95th birthday. 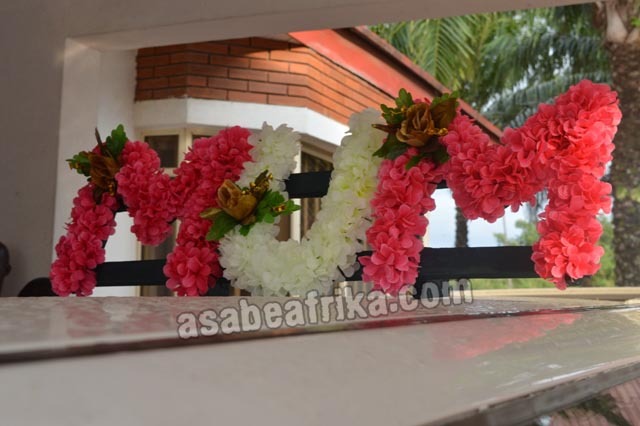 Hear the details on Asabeafrika for the very first time “My grandmother (I did not know her but her story was relayed to me by my mother) carried my mother’s pregnancy for more than the normal nine (9) months. During the labour for the birth of my mother, she was in great pains and had difficulties in the delivry of my mother”.  “In town at the time, there was a well known herbal traditionalist called Olujitan. He was approached for assisstance in the delivery of my mother by my grandfather’s family. In fact, my grandmother was taken to his house. The herbalist, Olujitan obliged but not without a condition that may be refered to in modern days as strange. However, in those days, such condition precedent to the kind of help sort from him was acceptable. This condition was, if the child was safely delivered and the baby happened to be a girl, on attaining a marriageable age, he will be given the girl’s hand in marriage. Of course, the condition was immediately accepted to save the lives of the mother and the unborn child”. Mama continued “Truly, my grandmother was delivered of a twin, a boy and a girl. In those days the delivery of twins was regarded as a bad omen and the children were usually killed, or at least one of them killed and burried. 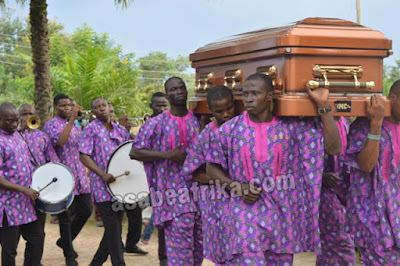 In this case, however, only the male child was killed and burried, leaving behind my mother who was spared so as to meet the terms of the herbalist, my father, Olujitan. When my mother grew up, the story was that she was very beautiful as such had many suitors. Consequently, she did not want to have anything to do with Olujitan, my father. She was however forced against her will in fulfilment of the unwritten agreement my father and the family of my mother had. My mother married Olujitan and I was the only child of the marriage before she divorced my father to re-marry. In fact, I was old enough to know when the divorce took place. 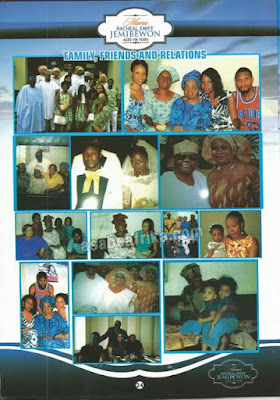 Soon after the divorce, my mother was re-married to Owonihi of Oroke (Aiyebayo, Yagba) and had a baby girl named Alenire. My mother soon thereafter, died. 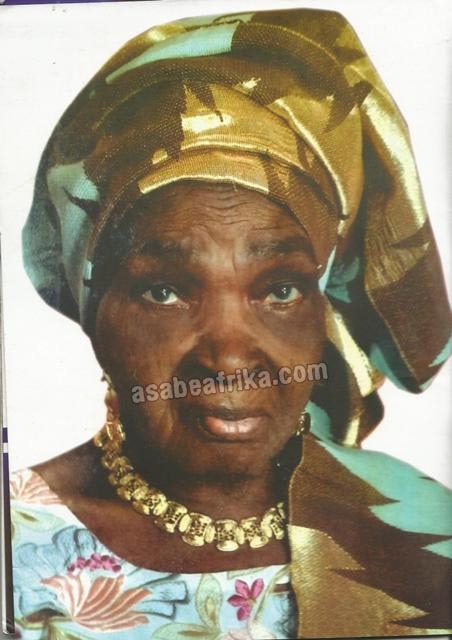 Alenire later grew up and was married to Chief Obajemu who later became the traditional ruler of Aiyedayo, Yagba. Alenire had an only child, a son Rowland Obajemu now resident at Amuro, Mopamuro LGA. Thus, my mother had only two of us, myself and my sister, Alenire of blessed memory”. The General sharing a joke with Bar. Tunde Ayeni & Bar. Segun Awolowo Jnr. 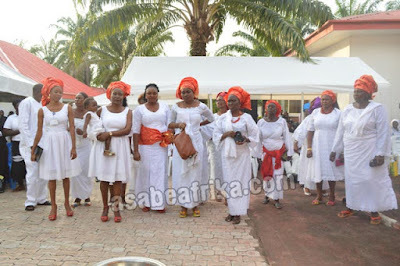 “After the divorce by my mother, I was taken to the female head of my mother’s family by name Eyinnomo to be cared for. As I grew up I was moved to my grandmother’s sister Mobayo (Iyemose) at Iyah. As I grew up and developed, many suitors started to frequent our residence, no doubt because of me. With so many young men looking for my hand in marriage, my grandmother’s brother, Mejofe (Daniel Ologe’s father)felt displeased. As he puts it, he did not want me to make a wrong choice. He therefore asked his sister, Mobayo (who now stood in place of my mother) to carry out some discreet investigations and consultations as to the suitability or otherwise of each suitor. Meanwhile, he too will do the same so that at the end, they would compare notes”. “At the end of the exercise, Mejofe favoured Jembe (Jemibewon) while Mobayo (Iyemose) objected. Mejofe favoured Jembe on the grounds of the reputation of his family—the Idamuro family for being very hardworking, which Mejofe believe will guarantee me a good future against hunger. 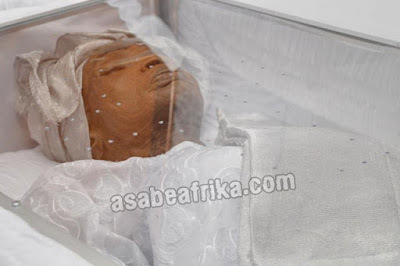 Mobayo (Iyemose) objected on the ground that Jembe is a name usually associated with “Abiku” (born-to-die syndrome). The mother of Jembe had many children, the first being a female who was the mother of Omoye Moloyo. Thereafter, she had many other children who died one after the other before Jembe was born. 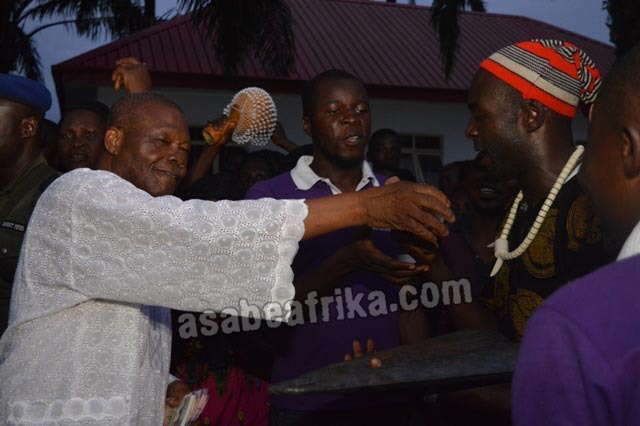 The name ‘Jembe’ in fact means “Let me appeal to them” (Jemibewon). When Mobayo (Iyemose), who actually was like my mother, realised that she had lost the battle against her brother whose choice for me was Jembe, she, Iyemose sent me packing from her house, a very devastating blow in those days. I had to move to Mejofe’s house. Thus, I was torn between my sister and my brother. As a result of this, I did not marry early or at the appropriate time as it was the custom in those days. 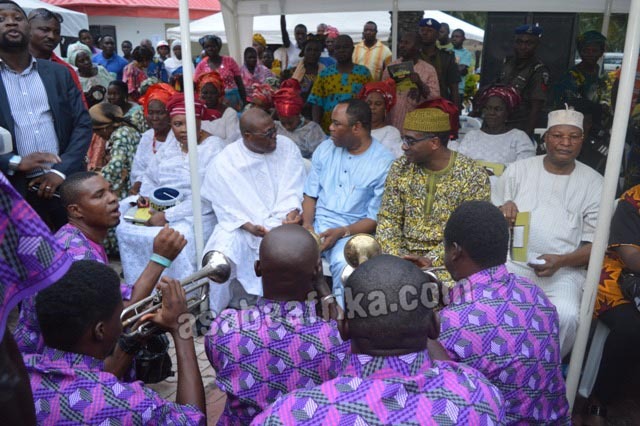 It took years to amicably settle this matter and when it was finally settled, I moved back to my mother’s house—Mobayo (Iyemose) who a few months after, gave me out in marriage to Idamuro family, symbolized byPeter Jembe Alemo around 1939”. 5. Ebun Jemibewon—She died at about the age of 10 from an enlargement of the spleen. Mama grew up to embrace Christianity and was baptised in the Baptist Church as a demonstration of giving her life to Christ. Since then, she has never looked back. Undoubtedly, the greatest attribute of Mama Rachael Emife Jemibewon is the love, care, accomodation and support she gave to her late husband, Pa Idamuro Jemibewon and the entire people of Iyah Community and all those that came across her. She lived with three (3) other wives of her late husband who were married to him after her. She shared the same roof with two (2) of these wives without any problem. 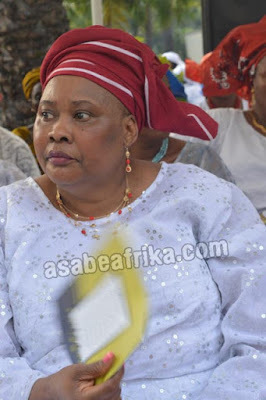 It is on good record and according to reports in her Autobiogrpahy written by her son, General David Jemibewon (CFR, Mni) that no one can claim to have settled any misunderstanding between Mama and any of her co-wives. Unfortunately, they all predeceased her. The children pray for their step mothers and dad: “We pray for the repose of their spirits and the spirit of our Dad who also passed to glory on 19th September, 1990 and was burried on 27th September, 1990 at the age of about 90 years”. “We (Children) believe very strongly, that without the total support of our mother, it would have been more difficult for our father, a peasant farmer to single handedly pay the way of our mother’s first child, Medaiyese, at Offa Grammar School, paying £37 Pounds 15 shillings each year in those days for a period of five (5) years and maintain him in the boarding house. This solid foundation sustained our family, as Medaiyese took responsibility for the younger ones on graduation in 1959” the Jemibewon family noted in the autobiography. 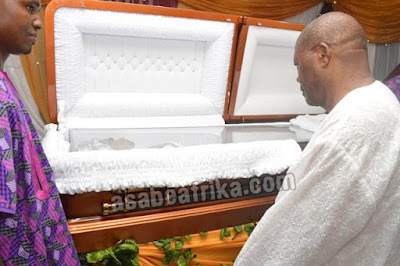 Why Mama was buried 13 days after her death. Do you know that Mama’s funeral took place exactly 13 days after her demise?. Yes, we counted; Mama passed away on Thursday July 21st and her funeral activities began with a multidenominational event termed ‘An evening of Tributes,Memories & Oration” on Wednesday, August 3, 2016. The event took place insde the Iyah-Gbedde Country home of her son, General David Jemibewon. The event which took place between the hours of 4pm and 6pm had in attendance prominent members of the Jemibewon family from Iyah-Gbedde and other neigbouring towns in Ijumu LGA of Kogi State. 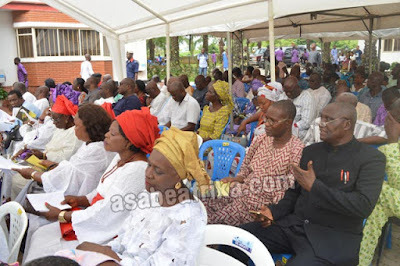 It was a joint event between the family and the leadership of the Christian Associaion of Nigeria (North Central) in conjunction with The Apostolic Church, Mama’s family church before her demise. 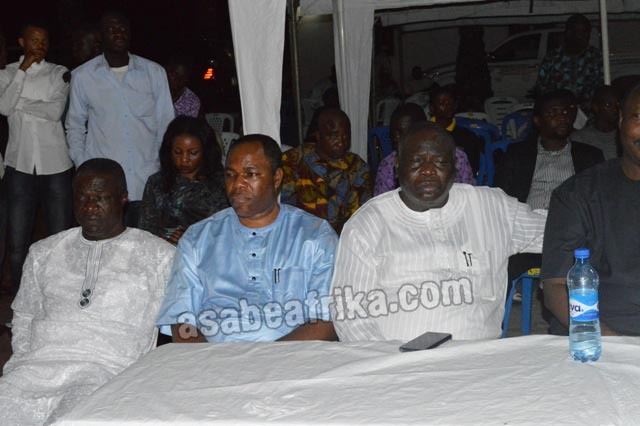 The Night or Oration equally witnessed the attendance of various women bodies like the Gbedde Women Council (GWC) Ijumu Women Council, Okun Women Congress, Ido-Osi Women Coaliation (IWC) and members of the Catholic Cathedral Women Forum (CCWF) from Catholic churches in Kogi and Ekiti States (North Central and South West Nigeria). The various groups shared testimonies of Mama’s kindness to people of her community and the role her son, General David Jemibewon played in the development of Iyah-Gbedde community in Kogi state. 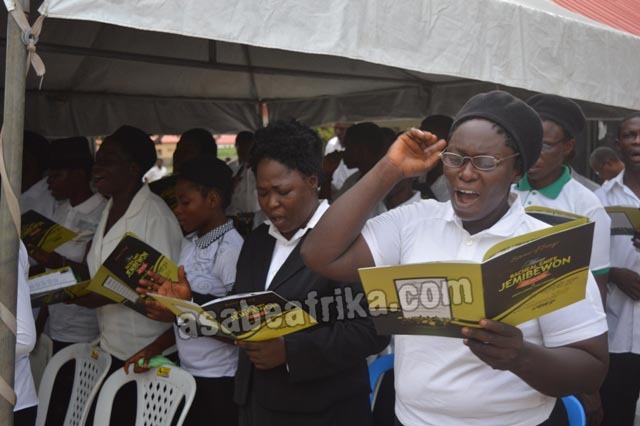 It was an event spiced with music, drama and other activities as a conglomerate of choir groups under the aegies of Christian Associan of Nigeria Choir (CAN-C) serenade guests. 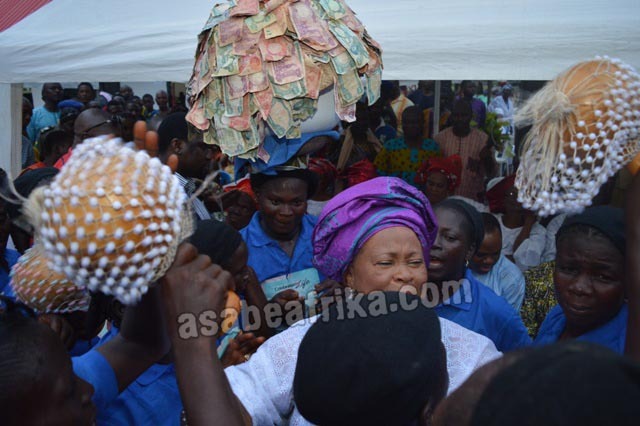 The last time Iyah-Gbedde as a community witnessed a surge of eminent personalities storming her for a big event was during Mama’s 95th birthday on July 21st, 2005. However, Mama’s lying-in-state program/Christian songs and wake keeping event witnessed a pout pouri of activities with several cultural groups taking up celebrations; churches under the aegis of Christian Association of Nigeria (CAN) organizing sermons and many top Nigerians giving away their schedules in Lagos, Abuja and elsewhere to attend the Thursday event in Kogi State. 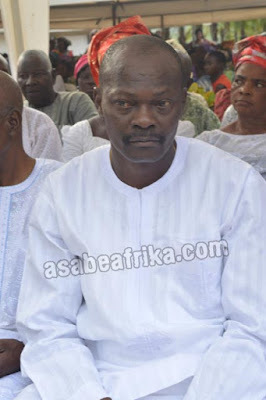 That such caliber of big men and captain of industries could storm Iyah Gbedde on a working day was a testimony of the goodwill of Mama’s star child, Major General David Medayese Jemibewon. As if living up to the philosophy of his Middle name, ‘Medayese’ (I am not doing this world alone) the funeral of the mother of the former Adjutant General of the Nigerian Army drew people from the diplomatic community, business community, political circle and the clergy to Iyah-Gbedde town with a large number of the General’s old and young friends storming his country home to honor his mother’s memory. As we noted earlier, the Church service which took place inside the General’s country home was handled by a conglomerate of churches which includes The Apostolic Church, The Catholic Church, Christ Apostolic Church and several other Christian denominations from Ijumu & Mopa areas of Kogi State under the banner of Christian Association of Nigeria (CAN). An hour into the service, Mama’s body arrived in a sparkling white Val Hearse. Her body was neatly laid inside a stylishly brown oak wood casket with her name and date of departure inscribed on the casket with the color of gold. 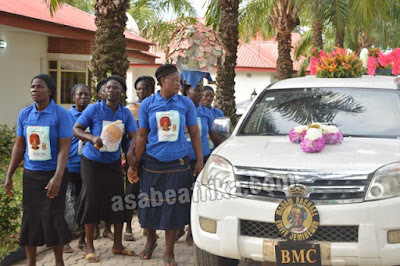 The undertaking company is BMC funerals led by Mr. Bolaji Mendez who equally handled the funeral of General David Jemibewon’s in-law, the late Chief JB Ajayi last year August in Orin Ekiti. 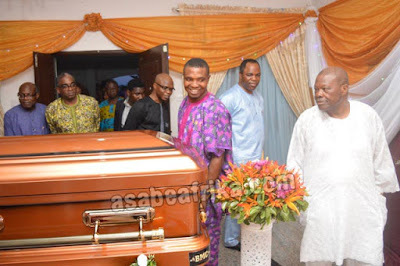 Funny enough, Chief Ajayi a former Principal of St. Patrick Grammar School, Ibadan too was buried in the first week of August last year just (between 6th and 8th) like Mama Emife Jemibewon. 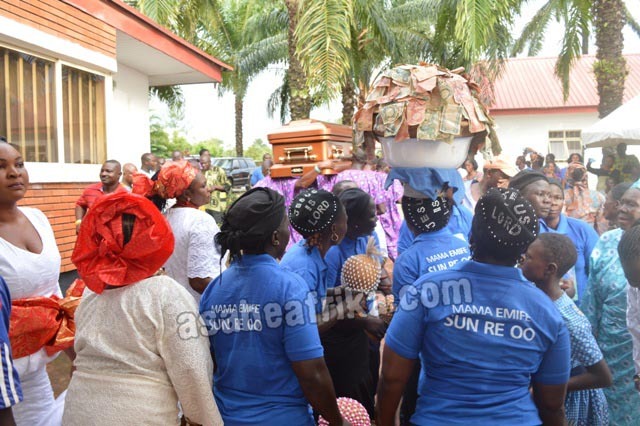 The Procession of Mama’s body from a Private Mortuary in Kabba down to her son’s country home was spiced with dancing and joyful display of acrobatics by an accompanied musical band. 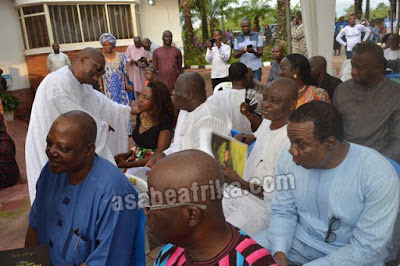 Do you know this man was the cynosure of all eyes immediately he stepped into the Iyah Gbede Country home of General David Medayese Jemibewon for Mama Rachael Emife Jemibewon’s funeral?. Strong and lean whispers kept flying about the actuality of his personality. The reason for this peculiar action is not farfetched. 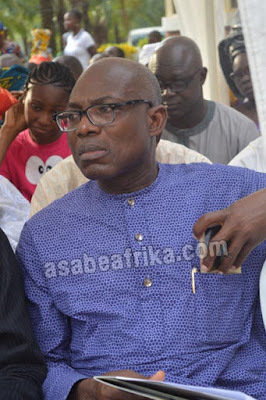 This eminent Okun son (The Yoruba tribes of Kogi West) has been facing some rough times in the last couple of months as a result of some oil deals involving his company, Atlantic Energy with the Nigerian National Petroleum Corporation (NNPC) while former Petroleum Minister, Dieziani Alison Madueke was in power. Jide Omokore’s name rings a bell in all corners of Nigeria and his stepping into General David Jemibewon’s Iyah Gbedde, Kogi country home on August 4 came with lots of big surprise on people’s faces. 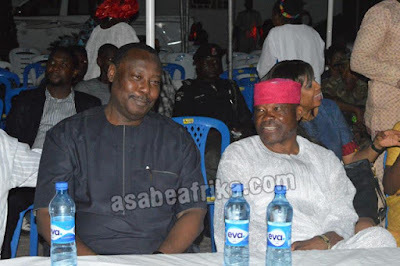 But those who know the truth said Omokore is one of General Jemibewon’s boys who have come a very long way with the former minister of Police Affairs. 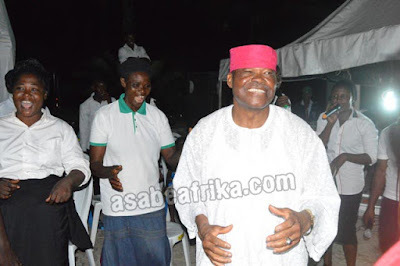 The General is said to be one of Omokore’s godfathers. It will be recalled that sometime in 2014; Jide Omokore had caused a major stir in the Nigerian media with his out of this world octane wedding bash for one of his scions in far away Dubai, the capital city of the United Arab Emirate. His son who was marrying the daughter of a northern top shot at the ministry of Petroleum (A Permanent Secretary) had gotten the attention of the high and mighty in Nigeria inside world’s tallest recreation facility, the 7 star Buruj-Al-Arab Hotel, Dubai. The Chairman of that Wedding reception was no other person than General David Jemibewon. 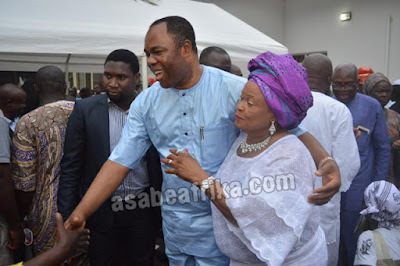 So, when Omokore came and waited till the very end of the Christian Wake Keep for Mama Rachael Emife Jemibewon, close sources to the family were not surprised. 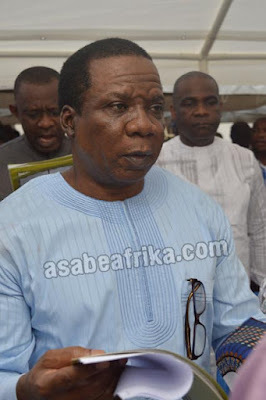 Omokore who is happily married to ex-Banker, Angella Ebagua is into oil trading and exploration, marine business, haulage services, steel, dredging and real estate. 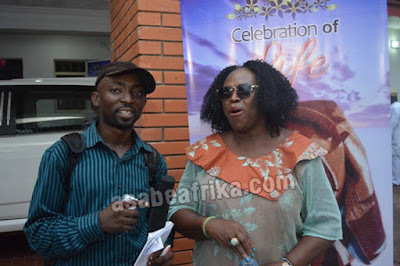 Ms. Folashade Olubo (Miss Kogi) with a male guest. The country home of General David Medayese Jemibewon in Iyah Gbedde came under water-tight security during the Thursday and Friday events as various security agencies from local vigilante groups in Iyah Gbedde down to the Nigerian Army, the Civil Defense Corps and the Nigerian Police manned every exit routes of the General’s country home. 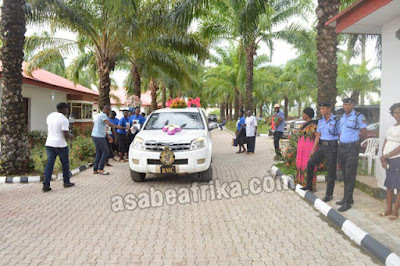 All guests arriving for the event were thoroughly searched at the gate and cleared before being allowed into the premises. The Police team who comported themselves very well at the event were led by Mr. Okoye Camillus a Superintendent of Police in charge of the Aiyetoro-Gbede Police Division, Kogi State while Mr. Dominic Amedu the Area Commander, Nigeria Civil Defense Corps for Kogi West ensured his boys gave the best security strategy for both the Thursday Service of Songs event and Friday funeral rites. 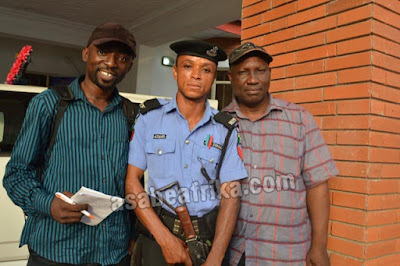 It was such a brilliant synergy between the Police, the Civil Defense Corps and other sister agencies. For the 3 days events to be successful, a committee of friends of General David Jemibewon was inaugurated. Heading the committee as Chairman is Prince Sola Akanmode, a former Deputy Chief of Staff at the Office of the Vice President of Nigeria during the reign of Vice President Atiku Abubakar. 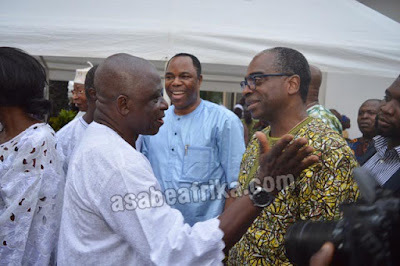 Prince Sola Akanmode and his younger brother, Prince Richard Akanmode who was equally an ex-Deputy Chief of Staff to immediate past Deputy Governor of Kogi State, Architect Yomi Awoniyi ensured that the three days events were not only timely but was well coordinated. 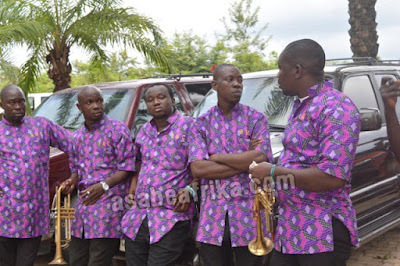 The Akanmode brothers who are also of the Okun stock in Kogi state are said to have come a long way with the General and almost a part of his family. Other Okun brothers of the General who made the event very impactful are Colonel Olusegun Oloruntoba (Who was also said to have handled a subcommittee of the burial committee); the others are Honorable Karimi, Richard Olonisha, Jide Omokore, Tunde Ayeni and many others. 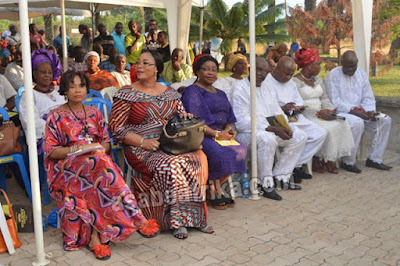 If there is one woman who is very smart and posses the ability to pull a crowd for an event at a very short notice, the name of Chief Mrs. Dupe Jemibewon will surely crop up. The beautiful wife of General David Jemibewon is one of the co-organizers of the event which was planned in less than 12 days. 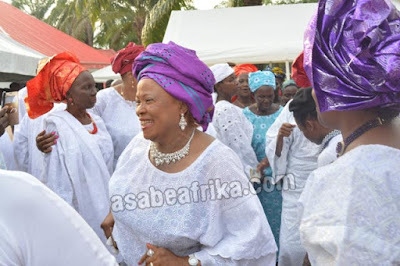 Apart from moving round Lagos and Abuja to distribute Aso-Ebi and invitation letters to friends and well-wishers, Mrs. Dupe Jemibewon who pulled the who-is-who in Lagos, Ibadan and Ekiti to her own father’s funeral at Orin Ekiti last year was said to have delegated authority to some of her aides and female associates to take care of guests invitation and other actions related to the event. 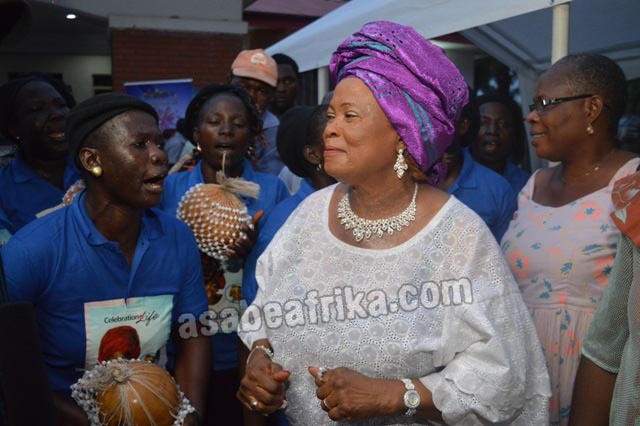 Some of her kitchen associates and aides who helped her with last minute activities is Madam Jane Nwabuzuba, her Personal Assistant of many years. Others are Madam Kehinde Omofe, Mrs. Alice Awopetu, Mrs. Funmi Abiodun, Princess Pegacious Sotanmi (Wife of Late General Sotanmi) and Madam Dupe Omoniyi who coordinated the Ekiti State guest list. 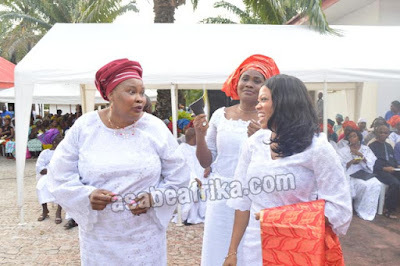 See what Dupe Jemibewon wrote about mother-in-law! 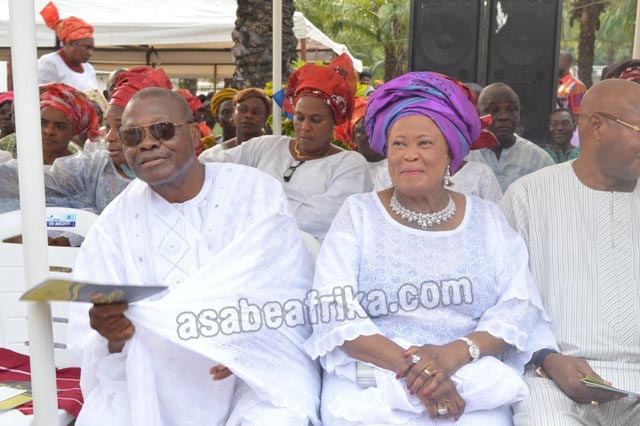 Do you know Chief Mrs. Dupe Jemibewon wrote a moving tribute for Mama in the event brochure?. Yes, she did. The tribute is titled “ODE TO A TOTAL MOTHER”. In the tribute, the very pretty and charming wife of General David Medayese Jemibewon described her mother-in-law as someone who didn’t bear grudges towards anyone in her lifetime. She started the tribute with a vernacular sentence “Iye Emife, Iya mi toto, Iye omo” and added a question in English “So, you eventually slept?” a prayer followed suit “May your soul find eternal rest in the bossom of the Lord our savior—Amen” Mrs. Jemibewon stated further “Mama, you were a good person in all ramifications. You had a clear vision as to what your children would become. You accepted me, the whole of me as one of your children. You made my relationship with your son, David Medaiyese very, very comfortable. You stood for for the truth and you lived by the truth” “You bore no malice towards anybody, indeed you were my pillar of strenght and comfort in this my Jerusalem. You gave me a charge to carry out, I hope I did not disappoint your beautiful person. When my mom passed on in 2009, you told me I still have you around, I should not be afraid. I thank you Mama Emife, our small talks stopped a while ago. I knew the end was near. I started missing you. I will miss you forever Iye Omo, Iya o Oloto, sun re o. Emi ni o Iye” (Mama Lola Modupe Ajayi Jemibewon). What a moving tribute? 106 Gbosa for Aunty Dupe! Although, Mama’s first and only surviving son, Major General David Medayese Jemibewon (Rtd) was in and out of bad and good moods for the three days he burried his mother, Mama Rachael Emife Jemibewon. But his glowing tribute for Mama in the event brochure sunmed up everything his mood stood for. The former Adjutant General of the Nigeria Army started with a question “Where do I begin?” before he continued “I am what I am today by the grace of God and the industrious and inimitable financial support Mama gave my dad wilingly and totally” “I didn’t know honestly, that Mama could live these years after loosing my immediate two younger brothers almost in succession; Kehinde Jemibewon on 24, October 2005 and Idowu Jemibewon on 25, May 2007, but the Almighty sustained her. When I had a nasty accident in February 2000, all my thoughts were centered first on my mother”. “To say I would miss her is not to admit that a critical part of me has indeed joyfully died. My mother remained full of life till the end. To witness this incredible physical specimen deteriorate but remained mentally alert and independent as ever always broke me down each time I was with her in the last few years. I am deeply grateful to God for granting her this final relief” Jemibewon wrote. This tall and ebony colored man seems to hate press cameras because he sat very quietly under one of the all white canopies facing that of General David Jemibewon and his family. Nobody will ever know this man is one of the richest oil barons in the entire middle belt area and in Kogi State particularly. His name is Chief Abiodun Ojo, he is the founder of Biodun Ojo & Sons, an oil marketing concern with several petrol stations in Kogi State. Some unconfirmed reports have it that he was a two time commissioner of Finance under the regime of ex-Governor Ibrahim Idris of Kogi State. Chief Ojo came in quietly and left quietly. Pastor R.J Silas is mama’s Pastor in her life time. Sources at the event said Mama had already instructed that he must be the one to preach at her funeral and that she conveyed the message to her children months before her demise. The Pastor while delivering sermon amidst the event of service of songs/lying-in-state gave his own testimony of the late Mama Rachael Emife Jemibewon describing her as ‘an epitome of family bond’. He said in her life time Mama’s major passion was to connect everybody in the family. “She made sure both the successful and the not too successful came together so that the successful ones among her children can aid the less privileged ones. Her spirit of motherhood touched everybody both within her immediate and extended family”. The man of God went ahead to tell the crowd of elite guests to always remember their villages and contribute to the development of their place of birth “Remember your village. Your village is your fountain and you cannot run away from your fountain”. 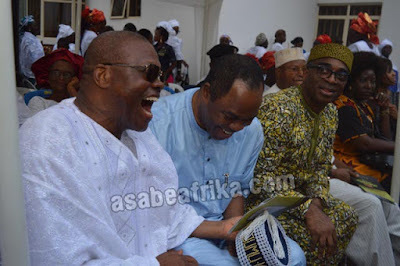 The man of God added “It is not good that you are a Governor, a Senator or a minister and your brother is driving Okada (motor cycle) around the village. Help them, develop them. That is what Mama did for her children and other people’s children during her lifetime. She did her best to connect and she detests underdevelopment in the life of people around her. I know her and my relationship with her is quite long. That was why she lived so long on earth. It is good to be good”. Other Men of God who joined Pastor Silas to conduct the service are Pastor M.E. 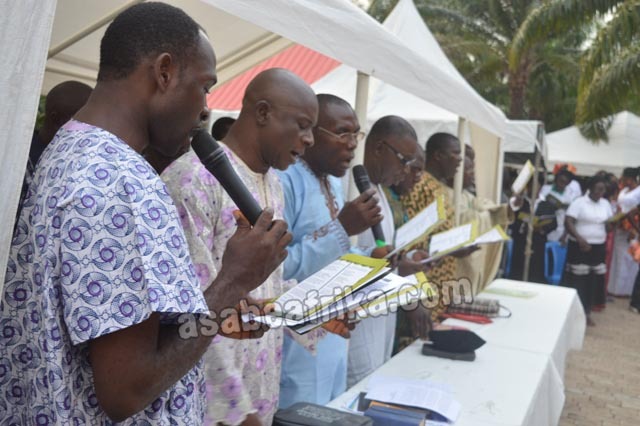 Agbenyi (Iyah Gbedde district Apostle), Pastor MB Ibrahim (Ayere district Pastor), Pastor P.E. Abodunde (Olorunsogo Assembly Pastor), Pastor J.O. Bonibayede (Temidire Assembly Pastor), Pastor D.O. Ajayi (Oloruntedo Assembly Pastor), Pastor T.S. 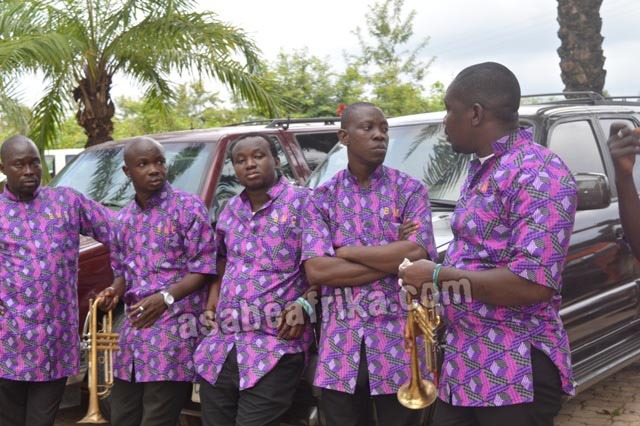 Olowosaye and a conglomerate of Choristers. This very pretty final year student of Kogi State University is the Present Miss Kogi (2015-2016). Her name is Olubo Folashade. She stormed the event and never left until the very end. Olubo Folashade who was personally identified by General David Jemibewon is studying Library Studies. Ronke Bello is one of Abuja (Nigeria’s capital city) big girls as she once worked with the Nigerian Television Authority until she resigned her appointment during the era of President Goodluck Jonathan to pick a media and protocol job at the Presidency. 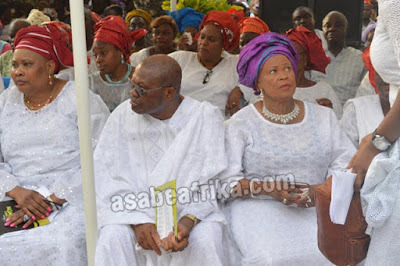 She was equally a close friend of the former First Lady Patience Jonathan. 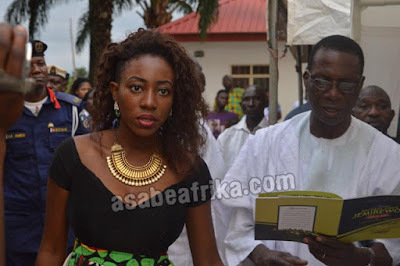 The ebony beautiful lady is said to be a famous indigene of Okun land in Kogi State. She holds a prominent title from Mopa-Moro land. Ronke Bello is the Erelu of Mopa land. Her new complimentary cards described her as a ‘Doctor’. The card which is very simple in design and majorly printed in three colors of white, black and gold has her name written as ‘Ronke Bello’ (Ph.D) with her London and Nigerian telephone lines inscribed on one side of the aesthetically matured complimentary card. At the back of the card is her private email address and worldwide address (www.ronkebello.com). Dr. Ronke Bello who left the Presidency after President Muhammad Buhari took over on May 29, 2015 is now a private content producer. 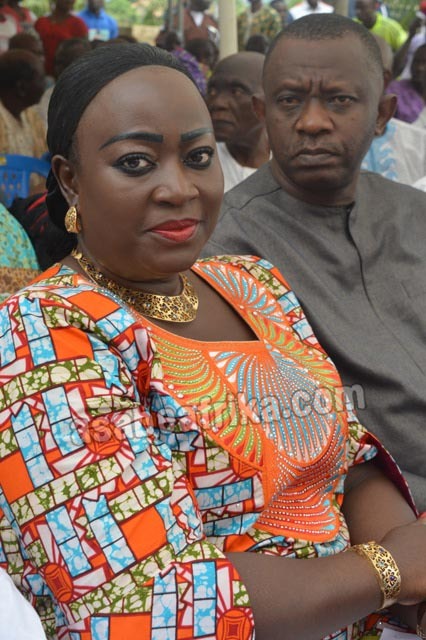 She was equally the cynosure of many eyes as she was dressed smartly for the Thursday Wake Keep/Service of Song for Mama Rachael Emife Jemibewon. 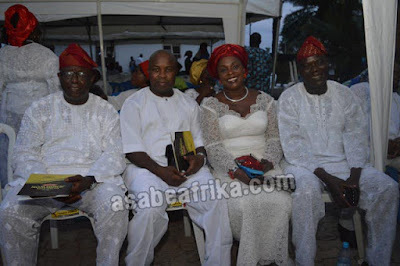 John Olatunde Ayeni the immediate Past Chairman of Skye Bank PLC and new owner of NITEL (now MTEL) is a famous business man known across Nigeria. His businesses cut across law, oil and gas, banking and finance, telecommunications and real estate. But to the Jemibewon family of Iyah-Gbedde, he is one of those boys who grew in the household. 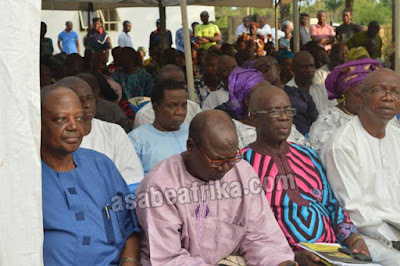 Last year, himself and one of his aides, John Darlington (Former MD of Bond Bank which was one of the banks accumulated by Skye Bank) were at Orin Ekiti to mourn with the Jemibewons over the demise of the General’s Father-in-law, Chief JB Ajayi. He stormed Iyah Gbede on Thursday afternoon in company of grandson of the late Political sage, Chief Obafemi Awolowo in the person of Barrister Segun Awolowo Jnr who is the Executive Director of the Nigerian Export Promotion Council (NEPC). The two big men arrived some minutes after 6pm as the wake keeping was rounding up. Sources close to the family said Mr. Ayeni and his friend; Barrister Segun Awolowo came straight from Abuja. The third person who arrived with them is Ms. Maureen Ideozu, Technical Advisor to the Executive Director, NEPC, Mr. Segun Awolowo. 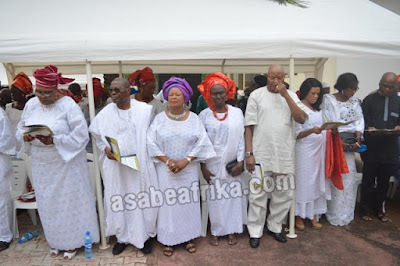 The day of Mama’s wake keep was exactly a month since the tall and handsome Iyah Gbede born business guru stepped down as Chairman of Skye Bank Plc. His arrival to the General’s country home immediately lit up the ambience of the funeral as the General and his wife, Madam Dupe Jemibewon threw banters with him and Segun Awolowo. 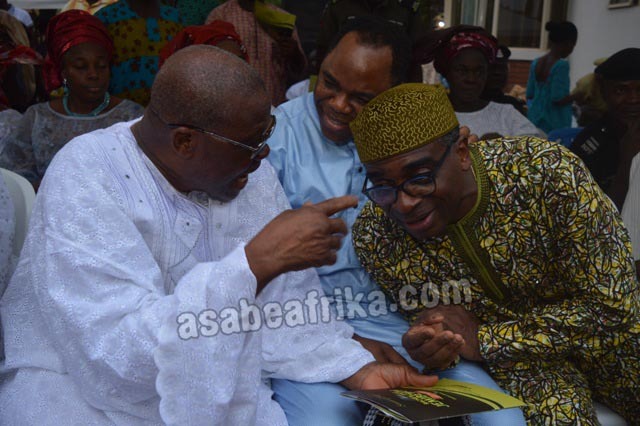 If there is one man that really earned the gratitude of General David Jemibewon among his external guests, he is no other person than Mr. Segun Awolowo Jnr, the grandson of late Chief Obafemi Awolowo and Executive Director of Nigeria Export Promotion Council (NEPC). This very handsome lawyer turned administrator is not only close to the Jemibewon family of Iyah-Gbedde but is also the boss to Omolola Jemibewon the beautiful daughter of General Jemibewon born to him by his darling wife, Chief (Mrs.) Dupe Jemibewon (Nee Ajayi). Omolola, a London School of economics trained administrator is one of the top executives of Nigeria Export Promotion Council, Abuja. She is said to be a dynamic and innovative staff due to her experience and exposure in USA, London and South Korea. 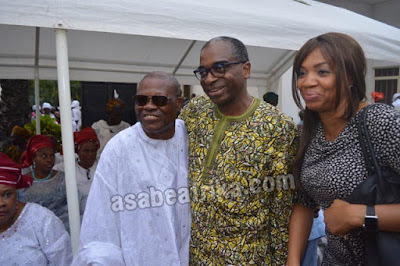 Omolola according to close sources is a Special Advisor to Mr. Awolowo. Segun Awolowo Jnr. was not only visible at the Wake Keeping Service; he was equally at the burial site the next day and the church service after the funeral. 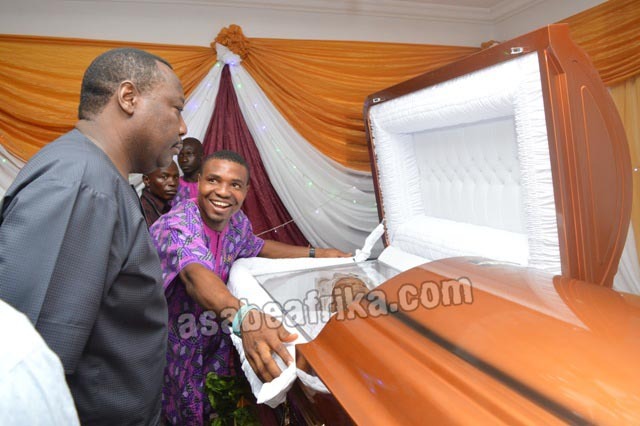 He didn’t leave Iyah Gbedde until the entire event for Mama Rachael Emife Jemibewon came to an end.